Amid Communist fears in the United States, American foreign policy focused on preventing the spread of Communism throughout the world. Excerpts from the Truman Doctrine speech, 1947. Click here for the full transcript. "It is logical that the United States should do whatever it is able to do to assist in the return of normal economic health to the world, without which there can be no political stability and no assured peace." Excerpt from the Marshall Plan. Click the image for the full document. Fears of communism grew inside of the United States, as people became worried of the viability of Containment. "We shall never have a secure peace or a happy world so long as ﻿Soviet communism﻿ dominates ﻿one-third﻿ of all of the peoples." 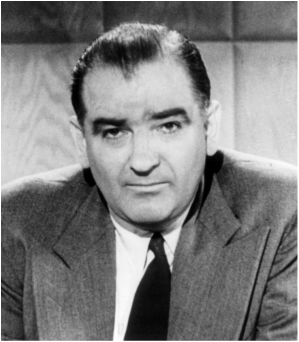 The fears of communism were enhanced by Senator Joseph McCarthy's continuous accusations of communism within the government, which often had little basis in fact. ﻿"I have here in my hand ﻿a list of two hundre﻿d ﻿and fi﻿ve peo﻿ple that were known ﻿to the Secretary of﻿ State as being members of the Communist Party and who nevertheless are still working and ﻿shaping the policy of the State Department."